For Israel, A Nuclear Iran Poses Existential Threat When Israel attacked Iraq's Osirak nuclear reactor in 1981, Iraq did not retaliate. Analysts say that wouldn't be the case today if Israel were to attack Iran's nuclear facilities. Yet many Israelis support a pre-emptive attack because they believe Iran's regime wants to eliminate their state. NPR looks at the Islamic republic, its suspected nuclear weapons program and its implications. 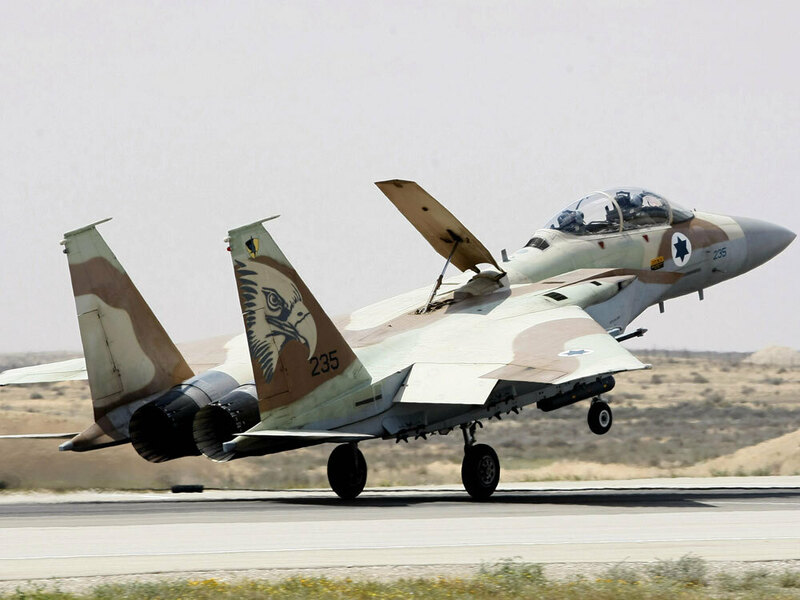 In this photo from March 2009, an Israeli Air Force F-15I fighter jet lands at the Hazerim Air Force Base in the southern Israeli Negev desert during a media event. The Israeli aerial arsenal includes the F-16I, which military officials said was capable of reaching Iranian airspace without refueling. On June 7, 1981, Israel launched the first confirmed military strike ever against a nuclear site. Israeli planes partially destroyed the Osirak reactor in Iraq. The Israeli government said the attack was carried out with the belief that Iraq intended to use the facility to build nuclear weapons to destroy Israel. There were no Israeli casualties in the operation. Iraq, then under the leadership of Saddam Hussein, did not retaliate. If Israel were to launch a first strike against Iran's nuclear facilities today, analysts say the scenario would be very different. Ephraim Kam, deputy director of the Institute for National Security Studies at Tel Aviv University, says the Iranians would have at least three options. "They will fire ballistic missiles against Israeli targets. [The] second option will be to use Hezbollah to warm up the border between Lebanon and Israel. [The] third possibility is that the Iranians will carry out, by themselves, terror operations against Israeli targets or Jewish targets," Kam says. 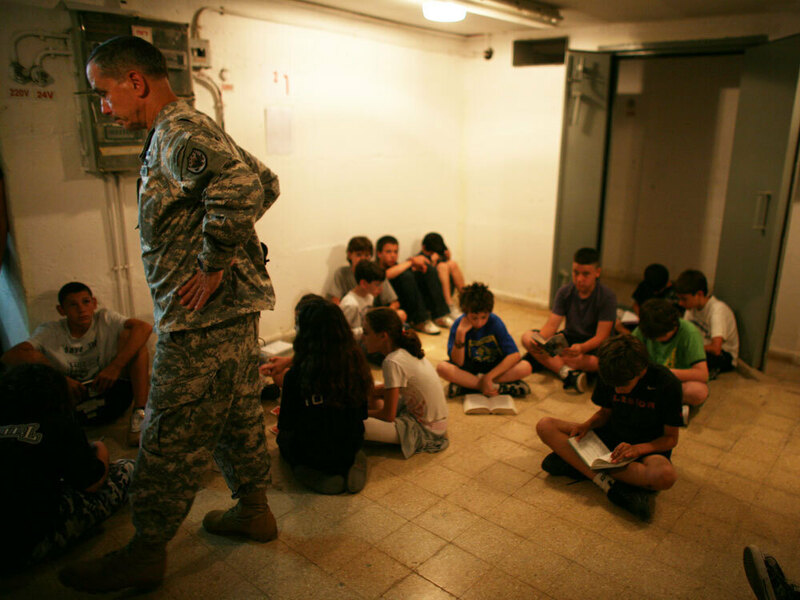 A U.S Army representative joins Israeli schoolchildren in a Tel Aviv bomb shelter on June 2, during a national exercise intended to raise the public's preparedness for possible missile attacks on the country. "If we are going to attack nuclear sites in Iran, it's going to take many years until this account will be closed. They won't forget it," he adds. Would Israel attack Iran's nuclear sites for the same reasons it launched the 1981 airstrikes against Iraq? Danny Ayalon, Israel's deputy foreign minister, says, "I think that [Israel] should not rule out any option." The United States and other Western powers have given Iran until the end of September to accept talks on its nuclear program. For now, Ayalon says, Israel is adopting a wait-and-see policy. "It is quite obvious that Iran should not become nuclear, full stop. The best way, of course, is diplomatic. The second best is through sanctions and economic pressure. But I hope we will not come to a point where we'll have to contemplate other options," he says. Many analysts here believe that Israel has not made up its mind yet what it will do if diplomacy and sanctions fail. But recent Israeli air and naval exercises suggest that Israel's military is prepared to attack, even if the country's politicians are still undecided. Israeli Prime Minister Benjamin Netanyahu is seen as hawkish on Iran, and Israelis support his position: A recent poll showed that 66 percent of Israelis would back a pre-emptive attack on Iran's nuclear facilities. Israelis see the Iranian nuclear threat as more than a simple issue of nuclear proliferation. Most believe that Iran's regime wants to eliminate their state. "Israel is willing to pay any price to ensure our existence here in our homeland," Ayalon says. "The Jewish people have suffered too much throughout history. We are not going to let it happen again. And that means that we will take all the measures to defend ourselves and to ensure that the Jewish state, the Jewish people and, for that matter, the entire civilized world, will not face extinction by a nuclear Iran." Even though the Israeli government says it has the right to act unilaterally, analysts believe it is unlikely to do so. They say Israel would need at least the tacit approval of Washington before acting. Meir Javedanfar is an Iran expert and analyst with the Middle East Economic and Political Analysis Co., a Tel Aviv-based think tank. "There are something like 140,000 American soldiers in Iraq. There are 35,000 American soldiers in Afghanistan. Any unilateral action against Iran could cause the Iranians to retaliate against American soldiers," Javedanfar says. "And if this is done without any American consent, that could put unbearable pressure on relations between Jerusalem and Washington, and this is something I don't think any Israeli administration is willing to risk." Since June, unrest over alleged election fraud in Iran has split the country's political establishment. 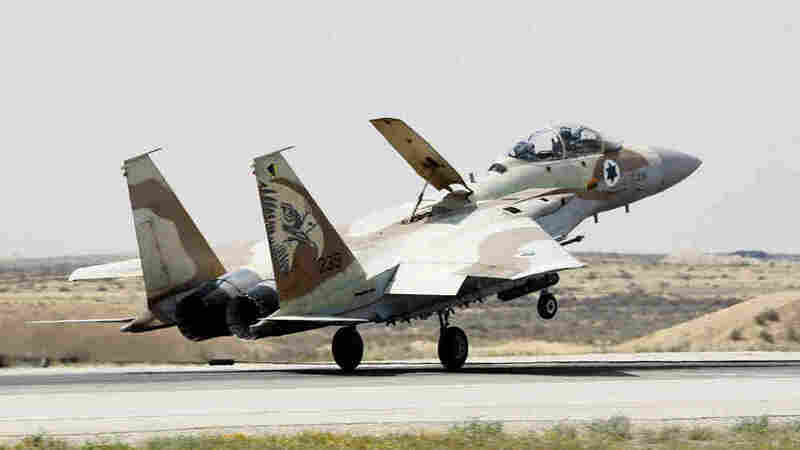 An Israeli attack could help rally support for an Iranian regime that the Israelis would rather see toppled. "There are huge cracks within the regime. These are serious man-made cracks. Even if Israel attacks, the [Iranian] public rallying around the flag will not be sufficient to fix those cracks. I think an Israeli attack would bolster the regime's popularity, but because of [its] loss of legitimacy, it is not going to be the regime's savior," Javedanfar says. Israel is thought to possess a large nuclear arsenal of its own that could deter any nuclear attack. So despite Israel's legitimate fears, even if Iran does acquire a nuclear weapon, it is unlikely to use it against the Jewish state. But that doesn't rule out other concerns, says Kam of Tel Aviv University. "If you are going to have two nuclear powers in this region that do not talk to each other, this might lead to disaster, because of miscalculation, misunderstanding, misperception," he says.